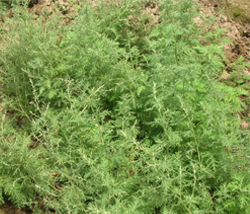 You are at:Home»Herbs»Asparagus racemosus Willd. Latin name : Asparagus racemosus Willd. Description : Satawar (Shatavari) is a pure herb extract. Satawar is considered to be the most helpful herb for women as it helps in balancing the female hormonal system. The main herbal rejuvenative for women, Satawar nourishes and cleanses the blood and the female reproductive organs thus supporting the body’s natural fertility. It nourishes the womb and ovum and supports the female organs for pregnancy. It also promotes body’s natural lactation. Satawar contains phyto-estrogens, the precursors of estrogen and is very useful for women who suffer from low natural estrogen levels as a result of menopause, hysterectomies or oophorectomies. Satawar treats PMS symptoms by relieving pain and controlling blood loss during menstruation. Recommended Dosage : 10 to 15 g powder of dried roots. Contraindication : Do not take this herb when kidneys are inflamed, as it increases the rate of urinary production. Do not use if you have oedema (swelling) due to impaired kidney or heart function. In rares cases, may cause dermatitis.